In the wake of the Lending Club debacle, there are a lot of eyes on the UK industry’s origination volume numbers. Any loss of confidence and momentum caused by contagion from across the pond may manifest itself in a fall in origination volumes. 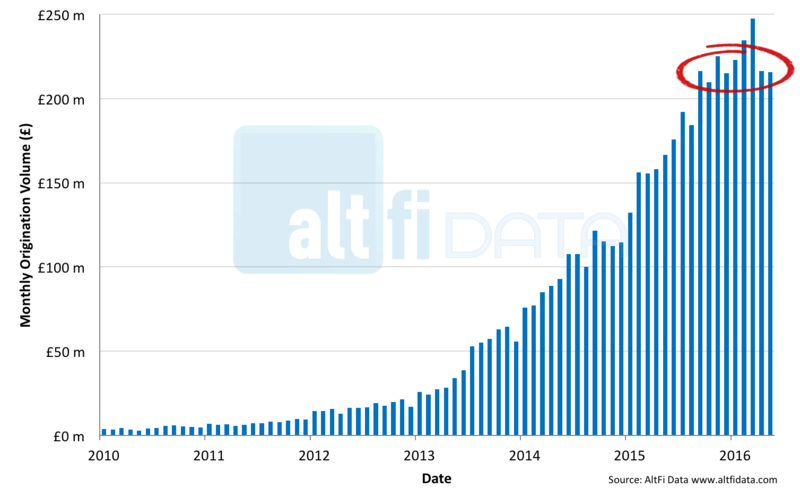 The month of May saw the UK alternative finance industry originate £282.1m. 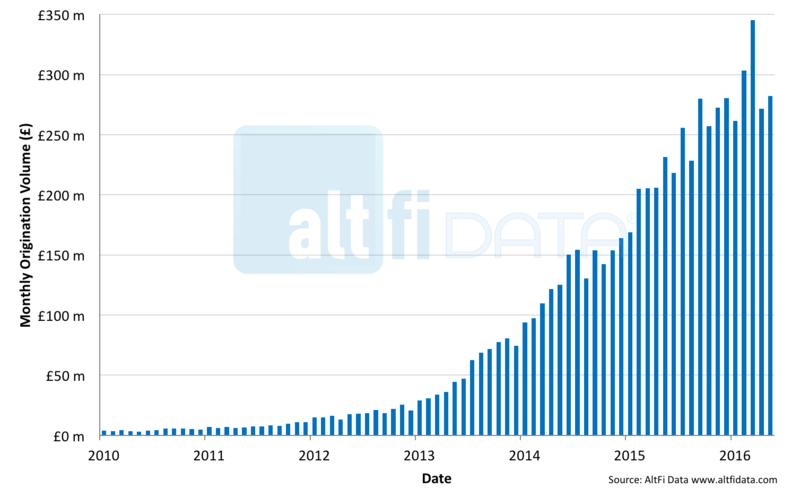 This took the Liberum AltFi Volume Index tantalisingly close to the £7bn mark with £1.46bn added to the figure in 2016 alone. A month ago we reported that there were signs of a slowdown in UK marketplace lending origination growth. May’s figures point to a continuation of this trend, only just beating April’s origination total. The industry is still originating new loans, it’s just that originations are not growing as quickly as they were. You can see for yourself in the chart in figure 1. Year on year growth for the month of May was 22% - well off the pace of year on year growth for 2015, which was 76%. Drilling down to a platform level helps to explain what is happening and why. The largest five platforms in the UK – Funding Circle, Zopa, RateSetter, MarketInvoice and LendInvest have been the driving force behind the sector’s growth. However, since the end of February these five platforms have begun to cede market share, dropping from 82% at its peak to 75% today, as can be seen in figure 2. Looking at the absolute monthly origination volume of the big five platforms, it can be seen that their combined origination has flatlined since September 2015 after many years of high growth – see figure 3. 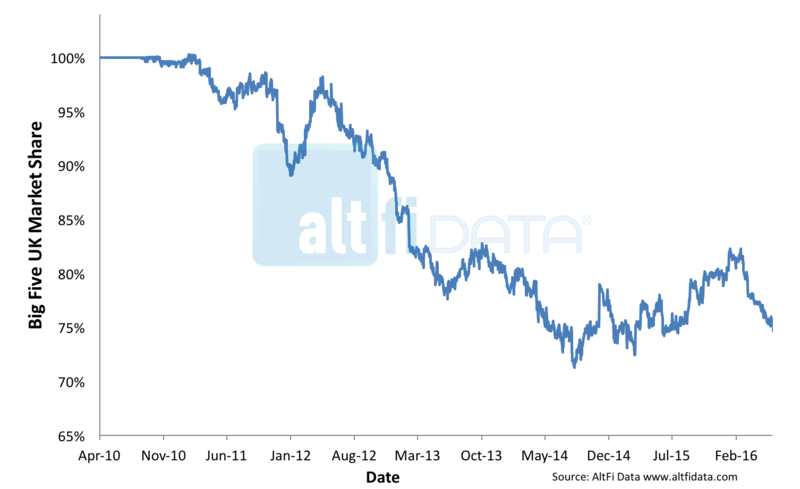 12 months ago there was a lot of talk about a ‘wall’ of money seeking to invest in marketplace lending. Permanent capital vehicles such as P2PGI and VSL were raising capital seemingly every few months with the vehicles trading at significant premia to NAV. These vehicles were the major provider of institutional capital to the UK sector. The growth limiting factor for the industry was the ability of the platforms to source credit worthy borrowers fast enough. The permanent capital vehicles are all but fully deployed and have not raised new capital for 11 months with their share prices at significant discounts to NAV. Therefore they are no longer turbo charging the sector’s origination growth. Wider credit markets are offering better returns than they did 12 months ago, reducing the appeal of marketplace lending to new institutional investors. The securitisation market has proven to be much tougher to crack than hoped with just one UK marketplace securitisation deal done to date. The Innovative Finance ISA, touted to bring a new wave of retail money into the sector, has yet to come on stream with platforms having to wait for full FCA authorisation before being able to offer the tax efficient wrapper to investors. The supply and demand scales have tipped – the growth limiting factor for the UK sector is now the availability of lending capital. Deals such as Funding Circle’s IPad giveaway and RateSetter’s £100 incentive for new investors putting in more than £1,000 underline this. Could this mean that we’ll see interest rates increase in order to attract more lenders? There have been hints of this happening in the US – such as Blue Elephant’s return to Prosper’s table that coincided with an increase in lending rates. We’ve not seen much evidence of this in the UK thus far, but we’ll be looking out for it, so watch this space!